AC's Coffee, a popular place on the Tanglefoot Plaza, is to reopen for business. AC’s Coffee at the Tanglefoot Trailhead in downtown New Albany is expected to open for business again tomorrow morning, Thursday, January 17, 2019. 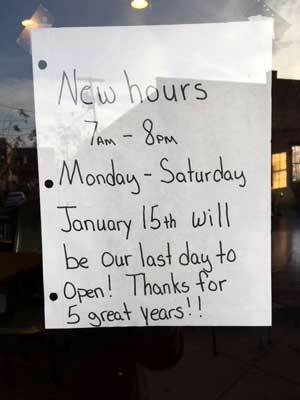 A notice appeared on AC’s front door earlier in January indicating the business would close, apparently for good, at the end of the day on Tuesday, January 15. Close it did, and it was not open Wednesday, January 16. In early January 2019, this sign on AC’s door announced their closing. Happily, things moved more quickly than might have been imagined. White told NAnewsweb.com early Wednesday evening, that AC’s Coffee would “open back up in the morning (Thursday) for good.” He said new ownership would be in place February 1. Good news for downtown New Albany! To the new owner; thank you for supporting downtown New Albany!